← The Tories Industrial Strategy is in tatters – we need a Labour Government to rebuild UK manufacturing. After a seven month absence left wing magazine Tribune was relaunched in Liverpool this week at two packed meetings, at The World Transformed and at the Labour Party Conference. The panel at the Labour Party launch included Jon Trickett MP, Class think tank director and Labour’s PPC for Chingford & Woodford Green, Faiza Shaheen, Tribune Associate Editor and Morning Star contributor Marcus Barnett and, Unite Assistant Chief of Staff, Adrian Weir. At the relaunce of the magazine Adrian Weir said: “Welcome to this relaunch meeting – sponsored by Unite – for Tribune magazine. My task today is to ensure that the re-launch of the magazine clearly carries Unite’s support. At the earlier launch at The World Transformed many speakers referred to Gramsci in their contributions but I’d like to go back to the original source material. I’m going to read a passage that is now almost 180 years old but will be instantly familiar. Recognition of this essential truth has been persistent in the Unite legacy unions. In the mid-1980s, in recognition of a 150th anniversary, the T&G sponsored a prestigious lecture series, the Henry Hetherington Memorial Lectures delivered by Ron Todd. Hetherington was the publisher the Poor Man’s Guardian that described itself as ‘a penny paper for the people.’ In 1833 Hetherington was selling 220,000 copies a week of The Poor Man’s Guardian. In the 1980s – the heyday of Thatcherism – the T&G and others strongly supported what was meant to be a mass circulation, popular, definitely left of centre, weekly newspaper, the News on Sunday. The first issue of News on Sunday appeared on 27 April 1987. Thanks to emergency funding from the T&G the paper did not fold during the General Election of June that year but did finally close in November 1987 by which time it had fallen into the hands of the notorious Owen Oyston. But moving on from the lecture circuit and the popular press I’d like to speak for a bit about support for and the future of the labour movement press. I guess as with the Republic of Cuba nobody expected that the Morning Star would survive the fall of the Soviet Union, but it has – with great support from the unions. Unions take copies for their offices, take copies to hand out free at their conferences and encourage branches to take out shareholdings in the PPPS, the co-op that owns the paper. In a similar way, the unions contributed to keeping the earlier version of Tribune alive. Variously headquartered in either ASLEF, T&G or Unite buildings, the old paper was peripatetic around London. Leading trade unionists and others provided copy for free; the T&G took 100 copies weekly that latterly became Unite taking 100 copies fortnightly. In the world of on-line only copy Unite, along with Unison, are identified as the big union sponsors of Labour List. We may anticipate that the left of centre media of the future is exclusively in the hands of Left Foot Forward, Skwawkbox and so on. But in the here and now Unite believes that the model devised by Tribune editor Ronan Burtenshaw and his team is compelling. A bi-monthly print version that carries more serious think pieces and long reads along with some news and culture associated with the Tribune heritage plus a digital version that allows Tribune to lead with frequent news and comment pieces seems to be a winner. Tribune is most certainly not a new entrant seeking to build a base – it’s been with us since 1937. 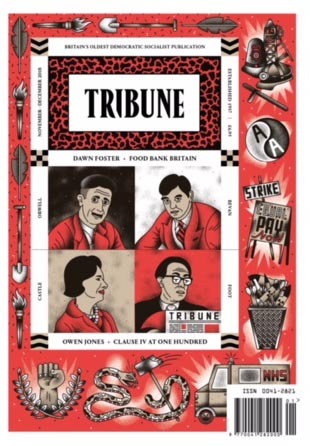 At one point Tribune was essential reading for those on the Labour left, we certainly hope that the re-launched, new version will reclaim that place. The Blairite hollowing out of the Party in the 1990s did not just demobilise our members and activists – is closed down discussion of policy and direction of our Party. Professor David Harvey on The World Transformed made the point that unfortunately some of the left became seduced by neo-liberal arguments. Perhaps most famously by Marxism Today. Although I don’t hold Professor Eric Hobsbawm as the worst offender of the Marxism Today group I think it’s very telling that Ronan has chosen to take issue with Hobsbawm’s Forward March of Labour Halted thesis as his first leading article. Arguably all that Marxism Today achieved, other than the liquidation of the Communist Party, was to open the door for the Blairite takeover of our Party. Blairism assumed it had won the battle of ideas; it effectively endorsed the end of history narrative. But, for example, with the establishment of CLASS and the Corbyn insurgency we’ve shown that that battle is not over. It is still the case that all of history is indeed the history of class struggle. This entry was posted in Blogs, Labour Party, Media, Trade Unions, Trades Union Congress, Unite The Union. Bookmark the permalink.